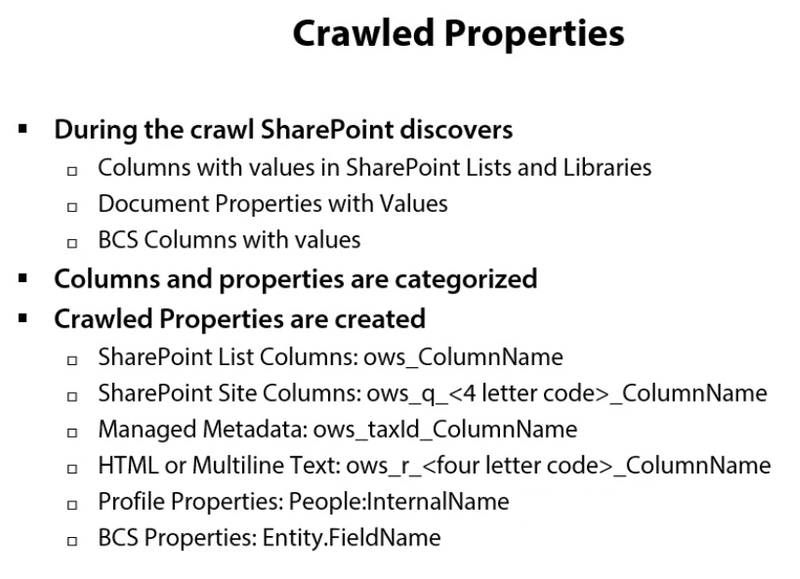 So for a List Column : Status what should be the crawled property name? First of all if it is a custom column, you need to find what is the internal name of that column. Go to List Settings --> Click on Column name and see what is the name in the URL (Field="Fieldname"). What is the type of the column? The crawled property naming convention is dependent on the type of the column. From the column name Status i assume it as a Choice field type. So for choice field type the naming of the crawled property would be : ows_q_CHCS_ColumnInternalName or ows_q_CHCM_ColumnInternalName (for multiselect choice). A well explanatory MSDN Article to get idea from site column to Managed Property. Assuming that it would be a choice column. The name of this property is generated by removing spaces from the site column name, and adding a prefix. The prefix that is added varies depending on the site column type. OK, this post is old but I would like to give my answer. Based on your input above here it is how you should look at it. So anything starting with ows_q_<4 Letters>_ indicates that it is a site column. In your case above it will be ows_Status. To distinguish between site columns and list columns simply check if the crawled property starts with ows_q_<4 Letters of you column type>_ is a site column otherwise ows_<your Internal field name> is your list column. Actually after full crawl , it turns out to be ows_status for Status column. For all the other list columns, the the crawled property with naming convention like ows_InternalColumnName are giving correct values for the respective columns wherease the crawled property with naming conventions like ows_q_FourLetterCode_InternalColumnName didn't worked for me. Another thing I noticed that the crawled property name may be case insensetive sometimes. Ive run into this many times, so what i do to overcome this is to initially name the field with an identifiable trait. Then, i would rename the field to just "Store"
Not the answer you're looking for? Browse other questions tagged sharepoint-online content-search-web-part crawled-property or ask your own question.